"We also want to extend our apologies to all players who misread information about game features." Wait, what? 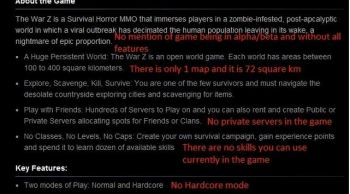 The War Z, Hammerpoint Interactive's entrant to the zombie survival horror MMO genre, is off to a very rocky start; so troubled, in fact, that its description on Steam had to be updated, after gamers complained that they'd been sold a sack of zombie giblets instead of the game they'd been promised. Hammerpoint's Sergey Titov was quick to step in with an apology, saying "we also want to extend our apologies to all players who misread information about game features." Yep; it's your fault for reading it wrong, according to Hammerpoint. Reddit went ever so slightly postal, in a thread titled "if this isn't false advertising, I don't know what is." Ultimately it wasn't the lack of polish but the lack of transparency on the development team's part that caused friction. People - like the Reddit commentator who created the graphic seen here from the Steam description page - believe what they bought just isn't what was advertised. Hammerpoint has rejoinders for many of the complaints. No, Hammerpoint says, it's not an Alpha or a Beta build; it's something called a Foundation Release, which has many - but not all - of the features Hammerpoint wants to implement. Yes, Hammerpoint says, the Steam description needs to be updated, and in fact this has already been done. Unfortunately it included items, like the skill trees, which Hammerpoint had hoped to have available for release, but in the end wasn't able to pull off. "I'm sure there'll be people who will look into small details and will say 'no I was mislead,'" said Titov to GameSpy "where in fact they imagined something to themselves without checking details first. I'm sure that Steam have its refund policies that should handle those situations." Update: Calling the premature launch "a mistake," it seems that The War Z has been temporarily pulled from the Steam store, pending "confidence in a new build." Players who have already purchased The War Z and wish to keep playing may do so, but for those who are not satisfied with this purchase are urged to submit a ticket to Steam Support for a refund, or check out our handy refund guide.